Choose from 4 Sizes. Guaranteed in 4 Hours. This dumpster is specifically designed for heavy materials like concrete, asphalt, brick, tile, dirt, and sand. It has a low profile for easy loading of these materials. Approximately 2-3 pick-up truck loads. This dumpster accommodates virtually any small to mid-sized residential or commercial project. At a height of 4 ft, it’s easy to load; yet it holds up to 8 tons of trash and materials. Approximately 4 pick-up truck loads. NO dirt, rock, concrete, brick, asphalt or sod. This dumpster is designed for medium-to-large projects, such as interior remodeling, de-cluttering or other interior projects. It’s the optimal size for trash removal during your next renovation. Approximately 8 pick-up truck loads. NO dirt, rock, concrete, brick, asphalt or sod. This is the largest of all Western Elite dumpsters. It is ideal for larger interior home renovations, household cleanups and commercial construction or renovation projects. Approximately 10 pick-up truck loads. NO dirt, rock, concrete, brick, asphalt or sod. Hazardous materials, food waste, liquid waste, toxic substances, pollutants, contaminants, infectious wastes, medical wastes or radioactive wastes defined by applicable federal, state or local laws or regulations. Need Help Choosing a Dumpster Size? Watch the video! Our roll-off container systems work best for customers with large volumes of bulky, non-compactable waste, such as construction refuse, scrap steel, glass, concrete, pallets and wooden crates. 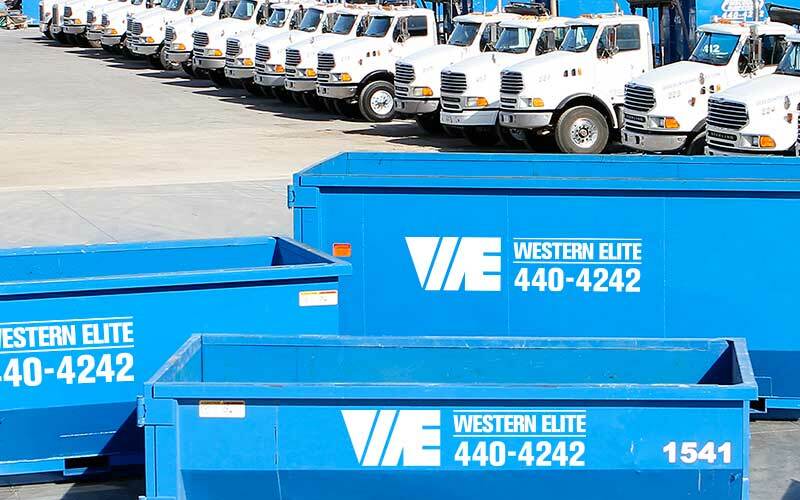 With Western Elite you can expect to find a variety of inventory and flexible, responsive scheduling to handle your fluctuating volumes. Available in the three above sizes, our roll-off containers can help you tackle any job, from construction and demolition projects to home or office clean-outs. Western Elite is a company that prides itself on keeping promises and providing an unsurpassed level of customer service. We promise to provide you with peace of mind in knowing that your dumpster will be delivered on time – every time. Serving Summerlin, Henderson & the greater Las Vegas area, we will be where you need us – when you need us. We always deliver clean, graffiti-free dumpsters and will work with you to ensure proper placement of your dumpster. As your partner, Western Elite will do all that we can to meet your expectations. Together, WE can make a difference! Guaranteed graffiti free. Your trash has never looked this good. In waste management, a partnership can be "indispensable." A complete solution to be free of debris and clear of clutter.